You may be wondering why I’m talking about ways to save money on haircuts for my first Frugal Hack series post and it’s quite simple really. Frugal living is about making value-based spending decisions that help you stretch your budget and saving money on haircuts is one of the easiest ways we save money in our house. Don’t believe me? The average haircut is $28 and $44 for women, and that’s not including any sort of tip either. Seeing as I typically get my hair cut every 5-6 weeks (max) and my wife every 8-10 that’s roughly $252 and $308, respectively, we could expect to spend per year – not including tips or our kids (which seem to be around $15 or so a haircut. So, if you’re looking for ways to save money on haircuts I’ve listed some of our favorite ways to do so. I know this may not be an option for everyone, but the top way I’ve found to save money on haircuts is by going the DIY approach. I’ve done this for about the past 20 years and have likely saved upwards of $5,000 over that span that I’ve been able to allocate toward other things in our budget. I’ve used this Wahl Haircut Kit for the past five years or so and used a very similar one prior that lasted for about 15 years. Another great way we’ve found to save money on hair care is by going to one of the beauty schools here in town. At $9, plus a tip, my wife can get her haircut or for $14 she can get a haircut and styling. Yes, there is the risk you get a “bad” cut, but we’ve not experienced that over the few years she has gone as there are always teachers assisting and roaming the floor as students are cutting hair. So, not only do you get to save money but you also provide them an opportunity to learn and everybody wins. Mrs. Frugal Rules had previously been paying at least $45 plus a $5 tip previously so this one simple change helps add a little more to our budget each year. Most will also do children’s haircuts, though it’s not as big of a savings as it is for men’s or women’s haircuts. Another option to save money on haircuts is to give to Locks of Love. You can find out more about Locks of Love on their site, but it’s a solid charity that offers something very simple to those in need. Anyway, how this can help you is many salons have arrangements with Locks of Love in which they’ll cut your hair for free if you donate it. Their site lists the different things they look for, but if you qualify and can locate a salon to do it for you, this can be another way to save money on haircuts. Frugality and coupons, who woulda thunk it? Seriously though, if you’re signed up with Groupon, Living Social or any other Daily Deal site this can be a great way to get a coupon to save money on hair products, or cuts for that matter as they run regularly in our area. Of course, this means you are okay with trying out someone new regularly, but it can be another potential option for saving money on haircuts. This was something I’d do when I was still paying to get my hair cut. I’d simply ask for someone new. Many times you’ll find in a salon or barber shop they’ll have a junior stylist who is simply looking for experience and to build a good reputation. The end result is you’ll likely get a lower cost for that haircut. It’s not a guarantee that your salon will have someone in this role, but it never hurts to ask. Now, I just go for the DIY approach with my Wahl Haircut Kit. 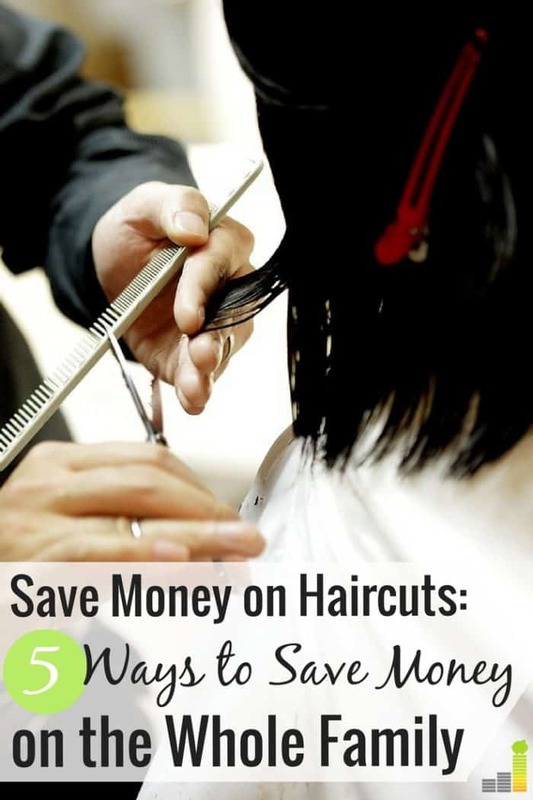 How do you save money on haircuts? What do you pay for a haircut? Would you let a friend or family member cut your hair if it meant getting it for free? I know what you’re saying Thomas. I want to just “Bic it” with my hair but my wife says it just wouldn’t look right. Short hair for women needs to be trimmed on a regular 4 week basis to maintain the shape/ style. To cut costs, I dont have the beautician wash or style it…just wet it and cut. This cost less and the tip is less. Hooray for home haircuts! We have the Wahl clippers set too and I buzz Mr. Frugalwoods’ hair every few weeks or so (whenever we remember or he starts to look really fuzzy 🙂 ). The first few times I did it were a bit dodgy, but with practice, it has become super easy and super quick. I can’t imagine paying for him to get a haircut ever again. My hair is in a state of limbo right now–I had it professionally cut over a year ago and haven’t done anything since… Mr. FW has offered to cut it, so I think we’re going to try that out. What’s the worst that can happen ;)? Right on Mrs. FW! It only took Mrs. Frugal Rules once or twice and she was a pro at cutting my hair. Now she just tells me when I’m reaching “Chia pet status” as she calls and we cut it. Ha ha, I don’t think I could live with the results of cutting my Ms. Frugal Rules’ hair either. Before my sister moved away, she was cutting my hair for me. It was an easy job because I keep the “messed up” look so nothing has to be perfect in terms of cutting. Just take some scissors and go to town! I was spending $250 a year before that. While that might not seem like much, by investing it, it has grown into a bigger amount. Ha ha, I can see how that’d be easy to maintain. Exactly – that’s what I love about it! I got married to save on haircuts. It was more of a bonus because it never came up while we were dating. Not only do I save money, but she has flexible hours. Nothing is cheaper than the ol’ DIY. I went this route not only for the cost savings, but the time and agony savings, as well. Think: no waiting in line at the barbershop, no driving/walking to barbershop, no painful conversations. It’s all good things! I never cut a strand of hair in my life until six months ago when I first went DIY. My hair looks exactly the same (and I do a small bit of styling). Exactly Eric! If I want it cut at 1 in the morning or just don’t want to go out then I can do that. I haven’t allowed my roommates to give me any at home haircuts yet… But I do go to one of the cheapest barbershops I can find in my neighborhood of Manhattan. They do a good job, and they have about 6 or 7 chairs, so I think that helps them lower their overhead for each barber enabling them to charge less than others in the area. Also, as they are cheap and do a decent job, they are always busy and keep churning people through the door. Can’t complain about cheap. If they have people going in and out then they have to be doing something right. For years I went to one stylist at a nearby no-frills place, and it was pretty reasonable, generally about $15 or so. She stopped working there, so I gave a local barber shop a try, and they do a fantastic job. It’s $12 and I tip $3 so it’s still about $15. I go every 4-5 weeks, so it’s hard to complain about that cost. That’s not a bad cost at all MB! Great point Tonya! My wife has short hair as well and that was one of the main reasons why she held off on trying the beauty school route. I left the ball in her court as I wasn’t going to tell her what to do with her hair and she was surprised at how well they do. I will say though, when she was living in LA I know she was paying much more than $44 so I know that “average” is highly relative. You and Jim kind of have the same hairstyle, so it’s easy to do at home! You can even give yourself a tip if you want. I have been coloring my own hair for the past year, and it saves $70 each time. I have not done the DIY haircut, but Great Clips at $7.99 isn’t too bad. I only get a haircut maybe twice a year anyway. I sometimes think about getting more of a shorter, stylish hairstyle, but I’d have to go get haircuts more often if I did that. $8 isn’t bad at all Kim! Nicole has thought about the DIY coloring but has held off. She had it colored in the past, but always paid to do it. Not being in the sun all the time like she was when she was in SoCal is holding her back from doing it now. The DIY color is easier if you have a second set of hands. I’ve done the semi permanent color, but it does not cover gray so well. My next step is going to be the henna variety as I do not want to dump toxic chemicals on my scalp and turn my hair to straw. There are some great YouTube videos on using henna and I plan to mix up some and cover my grays. Estimated cost being I need two kits for my length of hair will be under $20. The salon would charge me well over $150 and would use the toxic chemicals on my head. Second haircut post for me to read today… Is there some ESP floating around in the PF blogger world?? Anyway, I’ve been cutting Mr. Maroon’s hair for several years now. We started with fancier cuts (scissors, fades, etc.) but decided it was much better for our marriage to do a simple buzz. Mini Maroon #1 gets in on the action now too. I switched over to home coloring about six months ago. Definitely a huge savings. I have yet to venture into the self cut, but after today I am really tempted to give it a try. As a mom to two, my hair never leaves a ponytail anyway, so what’s the harm in at least giving it a try?? Ha ha, I didn’t see the other one! We give our sons buzzes as well. They weren’t so certain about it at first, but they love it in the summer. Nice post – thanks for sharing. My hair is a little bit styled so I can’t quite go DIY, but I do trim the sides & back myself (sometimes with Mrs’ help) every couple-few weeks, which helps me get about 2.5 months between trips to discount shop Great Clips. My wife gets an expensive salon hair cut once or twice a year and then rotates Great Clips in for those in-between clean-ups. Thanks Chris! Thanks for stopping by! I agree, vanity and apprehension do play a big role. For me, I work from home and have been doing it this way for so long it works. My wife cuts my hair and it’s always high quality despite the fact she has zero training. I started to go to Great Clips again this Fall so she would have more time (she started grad school so I thought I was helping her out) but wow…the money I’ve wasted there! They don’t do a good job of cutting your hair short so you have to go back every 2 weeks. Never again. Back to my wife cutting my hair. I would LOVE to save more money on my hair, but I am so scared to make any changes since it’s a large part of my overall physical appearance. I used to go every 8 weeks, though, and now I go every 12-14 weeks which has really helped save money over the course of a year. I totally get that Shannon! My wife was very much the same way and can completely understand that as it can be a huge change. At any rate, nice work on cutting down (bad pun I know 😉 ) on your number of trips per year. DIY all the way! When my wife and I were dating in college I told her either she could do it or I’d have another girl do it. She refused and I followed through. We’ve had a good thing going ever since. I don’t think I have a Great Clips in my area, but I go to Headcutters, which sounds similar. 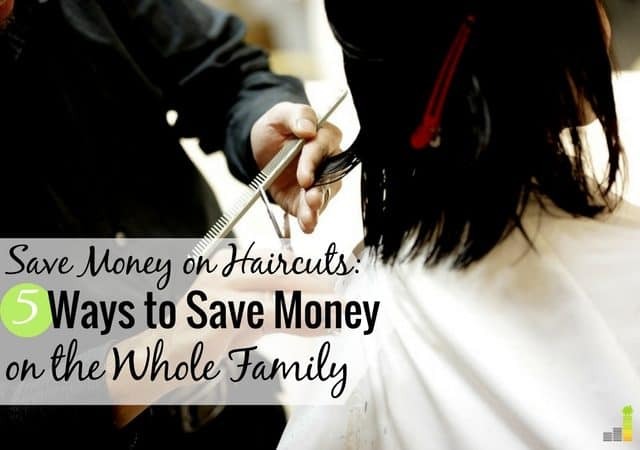 It is no frills–I don’t get offered coffee or cookies or feel pampered in any way, but I LOVE saving money on haircuts for the family! I pay $15 for a woman’s cut instead of $40 several years ago. I haven’t noticed any difference in quality of cuts between Headcutters and a fancy salon. Beauty schools seem to be a good idea! I also find that Youtube tutorials can be very helpful for situations like these. I give both of my boys their haircuts. Last time I took them to the barber I was not happy with the results. The hair was not cut evenly and I asked my boyfriend who cuts my hair to fix them as this was the second time in a row. So last Spring I looked at the boys and said, “This week you are getting haircuts”. I wanted to wait until they were out of school before I tried doing it myself. I checked out a couple Youtube videos first and felt I was ready to take the plunge as a mother who cuts her children’s hair. My youngest went first. I was a little nervous as I put the 1/2″ attachment on the clippers and turned them on. My boyfriend coached me on technique and supervised, giving me tips along the way. Well it was not hard. I wanted the younger one to have it shorter for the summer, so it was pretty much same length all over. Afterwards I took the attachment off and trimmed the sideburns and neckline. Scissors around the ears. It looked great. Then the older one, he wanted to keep it longer on top, so I clippered the sides, and then did scissor over comb cutting on top. My boyfriend did most of that. I did the sideburns and the neckline like my younger. OK, both were done. Brushed each off and then into the showers to rinse off the loose hair. After their hair dried I followed up to inspect my work. A few stray hairs needed attention, but I was extremely pleased with the result. My older son’s hair looked great, better than what he got at the barber shop.. Afterwards my mother saw the boys and complimented how nice their haircuts looked. She was surprised when I told her I (with a little help) did them. The annual savings thing really is important to me. I figured $30 a pop including tip for the two boys plus transportation costs of $15 round trip monthly. So that is $450. My hair being cut by my boyfriend every other month saves me $50 including tip plus $15 transportation costs, that is close to $400, and he has NEVER given me a bad haircut. I had gotten so bad haircuts at the salon, I used put off getting mine cut, because I hated having them not listen and do as they please, not what I asked for. So over $900 a year of my income is a lot of money I am saving that could be spent on groceries, clothes, etc. These are real savings, not I “saved” $ off the price of a shirt that was on sale that I bought because it is on sale. I am also very pleased with the result. It had to look good or I don’t think I could continue to do it. My boys’ haircuts came out great! And my boyfriend always does a great job cutting my hair. Discussing the savings with a couple ladies at work, they were impressed at the amount I am now saving, as well as how good the haircuts were, I showed them pictures and of course they have seen mine. So I say home haircuts are a great idea. I cut my husband and my four boys’ hair. It’s getting a bit more difficult now that my boys want “cool styles” but it usually ends ok if I watch some YouTube videos and take notes first. Soooo thankful for YouTube. We use a wahl cutting kit too- highly recommended. I have been cutting my own hair since I was 19, and my mom cut it before that, so I have never paid for a haircut, EVER. I had awesome hair as a teenager; red, thick, coarse, and wavy, cut in a short pompadour. Taking care of it was somewhat of a chore, however. I had to shampoo it every morning, comb it while it was still wet, and let it dry; that was the only way I could control it. My mom had a clipper, but I never let her use it on me; I liked my style even though it was sort of high-maintenance. When I was 19, I decided to try something new and gave myself a buzz cut while my parents weren’t home, and boy were they surprised! They didn’t really like it, so I usually only buzzed it in the spring and summer. Now I’m 30 and going bald, so I plan to keep it buzzed year round from now on. I like having a buzz cut now; it’s really grown on me (no pun intended) and I cut it myself once a week with a #1 guard. It looks cool, keeps me cool, and it feels like velvet! I use an Oster Adjusta-Groom clipper, which is identical to the well-liked Oster Fast Feed. This is a powerful professional-grade pivot motor clipper, and the difference is night and day compared with a Wahl or other magnetic clipper. It is much quieter and vibrates a lot less, and it cuts perfectly level without multiple passes and without snagging or pulling. I can do my entire haircut in less than 5 minutes, but I’ve had a lot of practice! I have owned my Oster clipper for about 9 years now and have used the heck out of it, and the blades are still sharp. I store it in a tackle box; the dividers keep my clipper, guards, oil bottle, and cleaning brush organized and protected. I oil the blades before using the clipper and clean it before putting it away. I have found cutting my own hair to be fast, easy, convenient, and fun, and that a professional-grade clipper makes it so much better. Don’t buy a cheap clipper; they’re awful! I have saved lots of money past 10 years but doing haircuts myself. I just Wahl. I also added resources on how to save money on haircuts and I linked to your article here on Frugal Rules.